A quiche by definition begins with a flaky, flour-based crust (and many people opt to buy a pre-made pie crust to make this first step easier). So if you're low-carb, you might assume quiches are best avoided. Should you just stick with your plain ol' veggie omelet for breakfast? There are no hard and fast rules when it comes to making quiches, so you're in luck. Leaving out the carb-heavy crust has actually become a popular take on this classic dish. In fact, crustless quiches are just as popular as regular ones nowadays—and a quick Google search will turn up tons of recipes. An added benefit of going crustless? They're easier to make since you have one less component to worry about. You do need some fat in the recipe to make it easy to remove from the pan, but unless you are making a super-low-fat version (using fat-free milk or non-dairy milk, for example), you don't need to worry about greasing the pan. If you are going very low-fat, be sure to grease it with butter or your choice of oil. 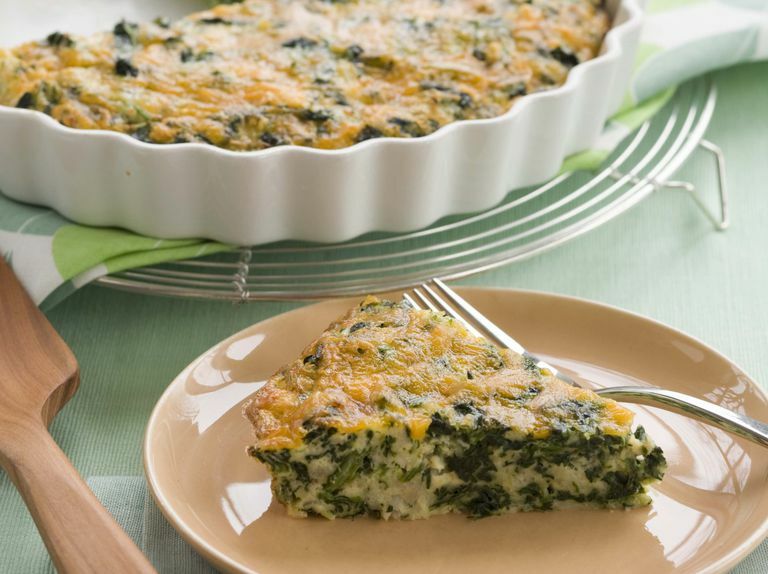 Here are the steps to making a delicious crustless quiche. The best part: You can dump whatever you've got in the fridge into this recipe. Deep-dish 9" pie pan - Pyrex works well, or dark metal. Shiny metal isn't as good. You can also make this in a 9" square casserole dish or a quiche pan. Prepare the solid ingredients. If the meats and/or vegetables are raw, sauté and season them on the stove. Spread the shredded cheese on top of the other ingredients. Now you'll make the custard by combining the eggs, milk, and seasonings, either in a bowl with a whisk or, my favorite, a blender. Beat or blend until a little frothy. I usually use salt, pepper, an herb or two, plus I usually throw in some spices when I cook the vegetables and meats on the stove. I also like a little dried mustard powder in my eggs. Pour the custard mixture over the solid ingredients, and put the pan on the center rack of your oven for 30-45 minutes. Begin checking the quiche at half an hour. If the top is browning too fast, cover the quiche with foil. You want the sides to be done (a knife inserted comes out clean), but the center to be a bit soft. It will continue to cook after removing from oven. Remove the quiche from oven and let set. Sprinkling the top with paprika is a nice touch. The center will cook in a few minutes. You can eat it warm, cold, or at room temperature. If you want a more specific recipe, try my smoked salmon, leek, and mushroom crustless quiche. Keep in mind that there are many easy ways to enjoy eggs. And if a quiche seems a little too arduous for your lazy Saturday morning, a frittata is even easier to make. Learn more about the difference between the two as well as many other egg dishes.